Quick note: This quick list of slang terms car dealers use and other terms common to dealerships is not meant to be a complete dictionary answering every “what does the word _____ mean?” when it comes to working in car sales. It’s the glossary included in the sales training book Assumptive Selling and was written as a reference for that book’s readers. It’s certainly not a complete guide to all the industry-specific terms you’ll hear in automotive retail; merely a short list of those terms used in the 400+ page book. Addendum – An addendum is a sticker or card attached next to the manufacturer’s (Monroney) label for new cars or next to the window sticker on used cars that details any dealer-installed accessories and/or market pricing adjustments. Allocation – While a precise definition of allocation and the way vehicles are allocated to dealers can differ from OEM to OEM, the general definition of this is the new vehicle inventory the OEM allows a dealer to purchase. For some OEMs, the allocation may relate to what is forced upon a dealer more than what the dealer actually wants to order. APR – Annual percentage rate; the interest rate. Back-End; Back – This term refers to the F&I functions in a dealership, and most often is used to identify the gross profit made in the business office. Bait and Switch – A very old-school (and illegal) practice of advertising a low price on a given vehicle that’s often not in-stock (the bait) only to switch the customer to an inferior or higher priced vehicle when they arrive. BDC – Business Development Center; Call Center. Bird Dog – The term bird dog can refer both to the person who sends you referral business and the fee you pay for these: “did you pay him his bird dog?” Originates from the term for hunting dogs who can retrieve prey for the hunter. Book of Business – There are multiple definitions of this term; though as it’s used in Assumptive Selling, it’s meant to describe everyone in your sales funnel (including prior customers). Box, The – Finance office; business office. Business Office – Any office or area that houses the F&I Managers. Buy-Here-Pay-Here – Describes a dealership that caters to subprime customers and most often carries the loans on the vehicles they sell. Car Drunk – When a buyer is presented with too many choices they will often get confused and need to go home to make their decision. This is sometimes called being car drunk. CRM – An acronym for Customer Relationship Management; though it’s most often used in automotive to describe the software the dealership uses for managing customer contacts. CSI – Stands for Customer Satisfaction Index and it refers to the rating system most OEMs use to grade a dealership’s performance (and the performance of the individual salespeople and managers) based on buyer responses to survey questions. Sometimes called SSI (Sales Satisfaction Index) or survey. Dealer Principal – The owner of the dealership. Demo Drive – Test drive. Desk Log – Generally a record of everything that’s happened and is happening today in the dealership on the sales side of the business. Used most often to record the Ups and track the progress of a deal. F&I – Finance and Insurance. FAB – Feature, Advantage, Benefit. A FAB Statement is a way to present a vehicle’s feature (like run flat tires), the advantage that it provides (allows you to drive an extra 50 miles on a flat tire), and how that benefits the buyer (you’ll be able to make it safely home or to the shop should you ever get a flat tire). Five-Pounder – Pound stands for $1,000 in this example and it refers to how much profit you made on a car deal. A five-pounder has $5,000 in gross profit (usually only on the front, though most dealers will either combine front and back to describe the profit or break them out and describe them both). Can be any number followed by pounder; though we referenced a five-pounder in the book. Floorplan – Refers to the money the dealership borrows to finance vehicle inventory. The dealer pays interest on this until a vehicle is sold and the floorplan reduced. Front-End; Front – The gross profit made on the sale of a vehicle, not including F&I (which is the back or back-end). Get-Me-Done – Someone with poor credit who is desperate to buy a vehicle. Green Pea – A salesperson new to the car business. Gross(es) – The gross profit of a deal; the difference between what an asset cost and how much it was sold for. The gross profit is used to pay salaries and all other business expenses. Whatever remains after that is called net or net profit. Hat Trick – Three vehicles sold in one day by single salesperson. Instant Retargeting – Presenting the online visitor an offer as soon as they leave your website (usually via website pop-under or in an adjacent tab in the browser) with the intention of generating an incremental sales lead. Lay Down – A buyer who agrees to everything and accepts your first offer. Mini – The smallest commission a salesperson can earn on a sale presented as a flat amount (sometimes called a flat). Minis are paid on car deals with little or no front-end gross. MMR – The Manheim Market Report provides an accurate estimate of what a dealer can expect to get for a vehicle sent to auction. Monroney Sticker; Monroney Label – The Monroney label or sticker (often just called the window sticker) is a label required to be displayed in all new vehicles sold in the US that includes the listing of options and other required information about the vehicle. It’s named after the late Mike Monroney, a former United States Senator from Oklahoma. Needs Analysis – The step in the road-to-the-sale where the salesperson attempts to gather information from a buyer related to the buyer’s situation and their actual vehicle needs and wants. OEM – Original Equipment Manufacturer. Toyota, Chevrolet and other new car manufacturers are often referred to as the OEM by dealers. Old Car Dog – Seasoned salesperson. One-Price Store – A dealership that does not negotiate. Sale prices are generally marked on every vehicle and the price you see is the price you pay. Orphan Owner – Describes both a sales customer who bought from the dealership and their salesperson no longer works there as well as a service customer who bought their vehicle elsewhere. In other words, they are without an assigned salesperson in the CRM; they are orphaned. Pack – Describes the amount of marketing and overhead costs allocated to a vehicle. The total pack reduces the commissionable gross on a deal like this: A vehicle is sold for $2,000 gross profit, though because it has a $500 pack, the commission is calculated on only $1,500. Pencil; First Pencil – The offer or worksheet presented to a buyer in the write-up. The first pencil is the first worksheet or offer the dealership presents. Phone Up Card – Often referred to as a call guide as it helps guide the salesperson or BDC agent on the best way to answer a call so that it ultimately results in a shown appointment and a sold vehicle. PMA – Primary Market Area. The territory assigned to a dealer. Road-to-the-Sale – The steps necessary to sell a car. Sales Desk; Sales Tower – The area where the desk/sales managers sit when penciling deals. Sales Funnel – This is a visual representation of every buyer and sales prospect the salesperson is working with or has worked with in the past. The bottom of the funnel represents those closest to the close, while the top of the funnel represents those who’ve just bought (and were moved from the bottom of the funnel back to the top) as well as those who might just be starting their research. Save-a-Deal Meeting – Usually a meeting of sales managers (new car, used car, finance) where every lost deal from the day before is reviewed and an action plan is developed for most of these. Service Walk – The part of a traditional road-to-the-sale where the salesperson introduces the new buyer to the dealership’s service department. Showroom Log – Like a desk log, but in most CRMs, displays just those customers currently at the dealership. Skating – When one salesperson attempts to sell or does sell a customer or Up that belonged to another salesperson. Soft Pull – An inquiry into a customer’s credit worthiness that does not impact their credit score (the way a hard pull would). T.O. – Stands for turn over and is most often used to describe an instance where the salesperson could not close a deal and needs a closer or manager to take over. In Assumptive Selling, most all connections between a manager and a buyer are referred to as a turn over or T.O. Tire-Kicker – A non-buyer; someone just browsing the lot looking at window stickers and kicking tires. Trade Walk – There are two definitions of trade walk that are important for salespeople to practice. As used in Assumptive Selling, the conversation a salesperson has with the buyer outside while walking around the trade and gathering information is called a trade walk. A more traditional definition of a trade walk is a daily gathering of salespeople outside to review the trades purchased the day before (so that they’ll know how to sell them). TT&L – Tax, title and license. Up Bus – A fictional mode of transportation that “delivers” the Ups to your dealership. We Owe – Something promised during the sale that cannot be delivered until later. For example, if you promised to add window tinting and special-order floor mats, you wouldn’t delay the sale and delivery of the vehicle, you’d just provide the customer a “We Owe” form detailing what you still owe them and then schedule them back into the dealership when you can provide these. 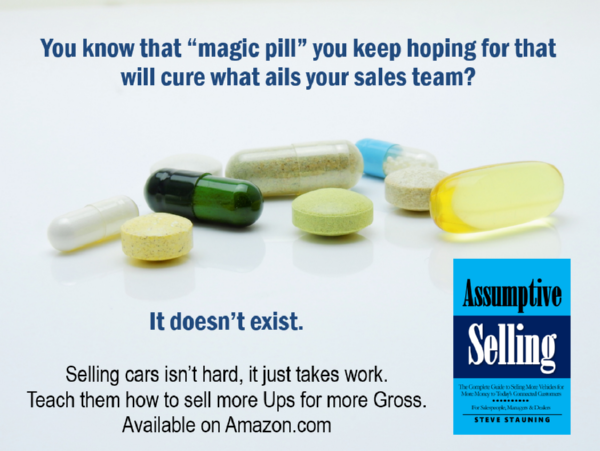 Go to Amazon.com to purchase single copies of Assumptive Selling: The Complete Guide to Selling More Vehicles for More Money to Today’s Connected Customers. For dealers, dealer groups, OEMs and industry vendors looking for 10 or more copies, contact Steve directly. Bulk pricing is $39 per copy for 10-19 or $29 per copy for 20+ copies. This is the all-in delivered price. 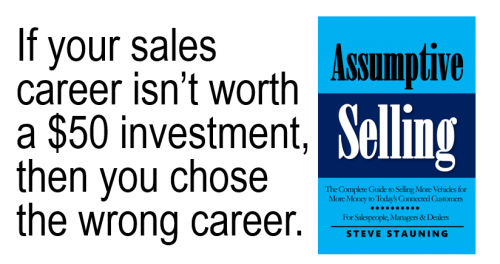 Click the link in this sentence to read more about the best sales training book for car salespeople and sales managers. « ‘Assumptive Selling’ Creates a Better Car-Buying Experience (and This Month, it May Help Create a Better Experience for a Worthy Couple)	» The SEM Thieves Aren’t Even Trying Anymore!